The 2014 FIBA World Cup is now firmly behind us and the basketball players from the NBA are now focusing on the 2014/15 NBA season that is starting in less than a month. It is easy to see that this is the event that players will need to focus all of their thoughts and energy on but it seems as though one player is allowing themselves to think a little further afield. 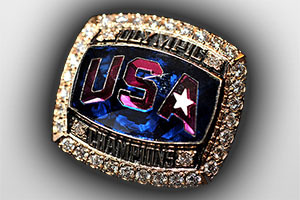 The USA triumph in Spain was expected but for the players and coaching staff involved, it was clearly a big thing. Not everyone felt the same way though because there is a feeling that the FIBA World Cup isn’t the big event in the sport. Who wants to go to Rio? This is because many believe that the Gold Medal you get from the Olympic basketball tournament is more prestigious than the gold medal from the FIBA World Cup. One player that holds this opinion is Kevin Durant from the Oklahoma City Thunder. This can be seen in the fact that Durant has announced his attention to play for USA team in the 2016 Olympics being held in Rio in Brazil. Everyone can see why you would want to make plans for a summer in Brazil but when you think that the player cited fatigue after dropping out of the FIBA World Cup team in August, you would think that he would be a little bit more subtle in his dealings. The fact that Durant has made an announcement so quickly clearly indicates the low level of respect he has for the FIBA World Cup and indicates what he thinks about the FIBA tournament. At the time, Durant stated that he was physically and mentally drained from the NBA season and his attention to his many responsibilities. Surely two years down the line Durant is likely to feel the same on the back of a tough and difficult season, in which case he may find it better to withdraw from the squad at this stage rather than at a late stage letting his coach down! Of course, when you are the MVP in the NBA, you earn the right to pick and choose some of your games, which may be exactly what Durant is doing here. The Thunder made it all the way to the Western Conference Final, so Durant did have a long season, but San Antonio Spurs, who defeated the Thunder in that Final and then went on to clinch the NBA Championships, had a longer campaign and they had players who managed to get involved with the FIBA World Cup. 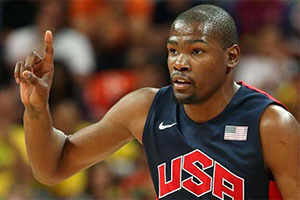 Durant’s absence didn’t cause too many problems for Team USA as they swept their rivals aside, winning every game in the tournament by at least 20 points. With that sort of margin of victory, you have to wonder if Durant should be allowed to waltz back into the national team set-up that has booked its place in Rio thanks to the win. There are some fans that think the 2014 FIBA World Cup triumph is of merit because it offers qualification to the World Cup, as opposed to worrying about the actual trophy or tournament itself. When you have players like Durant dropping out of the FIBA tournament but then declaring an interest in the main event that is nearly two years away, you can see why there is a perception problem surrounding the FIBA World Cup. There is a lot to be said about attitude in basketball but it seems as though when you are a top class player like Kevin Durant, you get a lot more leeway with what you can say or do.